Y-Vonne Hutchinson is the Founder & CEO of ReadySet and the Co-founder of Project Include, and her theme in this year’s TechChill will be about tech ethics. ReadySet is a high touch strategy consulting firm that helps companies build sustainably and inclusively through data-driven approaches. Their clients range from major technology companies to small nonprofits. Project Include is a non-profit that uses data and advocacy to accelerate diversity and inclusion solutions in the tech industry, urging companies to implement diversity and inclusion solutions that incorporate the following three values: inclusion, comprehensiveness, and accountability. Project Include believes that true diversity and inclusion means better teams, better financial returns, better companies and a better, more innovative world. Its mission is to give everyone a fair chance to succeed in tech. Prior to starting ReadySet and Project Include, Y-Vonne worked for nearly a decade as an international human rights and labour rights lawyer. In that career, she saw the power that works had over people’s lives. In 2015, Y-Vonne started ReadySet because she believed that technology was at the forefront of influencing the way we work and how we value workers. She’s also seen how technology influences our lives outside of work – the institutions that we build and the rights that we hold. For example, in early 2015, an engineering manager at Twitter discovered a vast trove of inactive and fake accounts with Russian and Ukrainian IP addresses. When he brought this anomaly to the attention of his bosses he was ignored. Later that year, Twitter dismissed him in a round of job cuts. The only African American in the company in a leadership position, he soon blew the whistle on the organization’s hostile working environment, accusing the company of groupthink and a lack of diversity in action. Eventually, some of the accounts he discovered went on to spread propaganda during the 2016 election, heavily influencing its outcome. 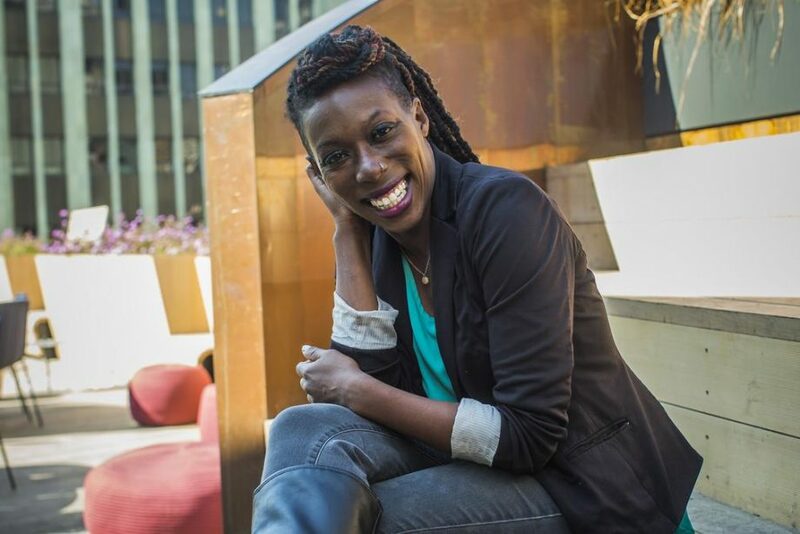 That story, and the intersection that relationship that it illustrated between diversity, inclusion, and ethics made Y-Vonne realize that the mission to increase diversity and inclusion in tech wasn’t just an economic one, it was a societal one. Y-Vonne explains that when people talk about the ethical case for more diverse and inclusive tech, they mainly refer to the idea that diversity and inclusion is an ethical imperative. However, perhaps even more compellingly, diverse and inclusive teams also perform more ethically than homogeneous ones. Y-Vonne also ads, that by ignoring the ethical impact of the technology we develop the powerful tech companies we build can have devastating consequences. Her appearance on the stage in many cases explores the relationship between the teams we build, the products they make, and the ethical impact those products have. In one of her speeches, Y-Vonne explains, how as a child she didn’t really want to believe that discrimination existed. She rather chose to believe that she was crazy, not the fact, that she will have to work harder for longer, that by accidental birth there were things that she wanted, but she simply might not get, that the world was a little bit more dangerous to her, the fact that no matter how hard she had worked, some people just won’t acknowledge her. Back then she believed that she was above it, that her personality and her accomplishments, fancy degrees would protect her. Later, in her experience, nothing could have been further from the truth. Now Y-Vonne thinks, that discrimination is a fundamentally irrational way of thinking, it is slippery, it masks itself as other things and it is tempting to deny. It is hard to know where exactly bias begins and where it ends. Therefore data is their way out of madness; it gives the ability to tangle the irrationality and bias of exclusion and by routing it into something more concrete. Y-Vonne strongly believes that it moves us from the subjective to the objective, that it can show us the impact at scale and most importantly it helps us to understand our challenges better so we could work more effectively and target our solutions. As it is widely emphasized in Project Includes’ statement, studies quantify the financial benefits of racial, ethnic and gender diversity 1 – and the many ways diversity improves company performance. 2 Research shows how bias results in discrimination in educating, hiring, promoting, paying, and funding underrepresented people of colour in tech; 3 tech company data show the extreme lack of diversity of employees and management. 4 Change is hard, especially around a multidimensional issue like diversity. It is easy for all of us to become defensive and emotional, to shift the blame to others, and to feel fundamentally unheard or misunderstood. It is so uncomfortable for us to talk about the diversity problem that we have not been able to acknowledge it in full. “We want to help”, is written in Project Include web-page. They convened as a group of tech women to move diversity forward by facilitating hard conversations and redirecting efforts and they would like to bring together the most innovative CEOs to design initiatives with lasting and meaningful impact – ones that drive the greatest possible improvements over time, inspiring even more ambitious efforts, and transforming behaviour and expectations across the tech industry. Right now they are focusing on CEOs and management of early to mid-stage tech startups, where they believe change is possible and can have a broad impact even beyond the industry. Y-Vonne Hutchinson is not just the co-founder and advisor of Project Include, but also the founder of Ready Set, a diversity solutions firm based in Oakland, CA. Prior to launching ReadySet, she has worked as an international labour and human rights lawyer for nearly a decade, including working with foreign national governments, the US Department of State, and the UN. She is a member of Harvard Law’s Institute for Global Law and Policy network and besides an expert on labour relations and diversity in the workplace. She’s presented on diversity, inclusion, and labour issues at Harvard Law, MIT Sloan, and UC Berkeley, as well as conferences around the globe. She holds a JD from Harvard Law School. She also serves on the Women of Color Council for the Anita Borg Institute and the board of the San Francisco New Leaders Council. Intrigued to hear more about diversity and inclusion in tech from Y-Vonne Hutchinson, then take action and secure your TechChill 2018 pass right now!